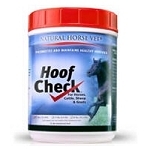 Hoof Check 3-pack = Big Savings ! Since I started giving my horses Hoof Check year-round , their hooves are even stronger through the winter We ride frequently in winter here in upstate New York, and even though hoof growth typically slows down during the colder months, we've noticed their hooves grow just as much and are just as strong. I highly recommend Hoof Check all year, coupled with lots of barefoot riding on hard-packed ground for thicker,, tougher soles,, and harder hoof walls. Our natural barefoot trimmer comes once a month (even in winter), and says our horses' feet are the healthiest of all her clients! The 3-pack is a great savings if you have multiple horses, too! 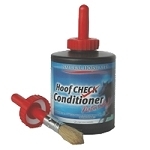 This product works so well, we are able to keep our horses barefoot even while showing!